Humanity is losing the fight against the Kaiju, monstrous creatures rising from the depths of the sea, bringing death and destruction with them. The people of earth have banded together to create the Jaegers, giant mechanical war robots to combat the Kaiju. Proving too powerful over time for the humans to combat, the Kaiju grow in numbers and in strength. Humanity’s last hope rests on an obsolete Jaeger pilot, Raleigh Becket (Charlie Hunnam) and Rinko Kikuchi (Mako Mori), a talented trainee who’s yet to battle against the colossal sea monsters. Let get this out of the way really early on. Pacific Rim is Godzilla with robots. Well, a more Americanised version of the classic Japanese monster masher. The word Kaiju is actually Japanese for “strange creature”. The ghost of the giant Japanese creature is all over the film and thankfully director, Guillermo Del Toro, does not hide from this but he embraces it. The opening sequence has a distinctly Japanese style in what is a lovely homage to the history of this kind of film. Unfortunately, this style does not carry throughout the film. It is quickly watered down to over the top speeches, acting and the usual formulaic approach to all aspects of blockbuster American filmmaking. Like all Del Toro’s films, the set design and overall production design are fantastic. The film has a vibrant, over the top and colourful style throughout and it really help the sub-average script along. No one in their right mind sees a movie like this and expects Oscar nominated performances, but the casting could have been much better. Charlie Hunnam (Sons of anarchy) is weak and simply a bore from the start. He has zero charisma and even less charm. Quite simply, if Del Toro chose to replace the “actor” with a sock puppet, he’d probably get a more grounded and likable performance. Even during the physical scenes he looks over rehearsed and uncomfortable in his own skin. The audience shouldn’t be waiting in desperate hope for the lead character to get knocked out during key fight sequences, should they? While clean-cut hero roles have little room to move as far as acting is concerned, there is such a thing as “screen presence”, of which Charlie Hunnam has none. Mako Mori plays the damaged trainee Rinko and she is as bland as stale bread to match. Spending most of the film peeking up from under a fringe, she plays such a forgettable role that it’s more entertaining to count the flashing buttons around her, than to care about what her character is trying to achieve. Overly long scenes explaining her past have some convincing acting in it, and this helps her character. However, it is another young actor Mana Ashida, performing these scenes. The most ridiculous thing being Ashida easily upstages Mori, and she is a child. Charlie Day plays his same role as Charlie from It’s always sunny in Philadelphia, but this time he has glasses. Ron Pearlman (Hellboy, another Del Toro film) has a small role, which helps to add a bit of character and viewer interest. This is an actor that does have the previously mentioned “screen presence”. Idris Elba (Prometheus), plays Stacker Pentecost, who is a basically like every other blunt instrument military commander, you’ve seen in every other blockbuster. This film isn’t so much about the script and acting though, it’s about the destruction, and thankfully there’s a fair amount of it. 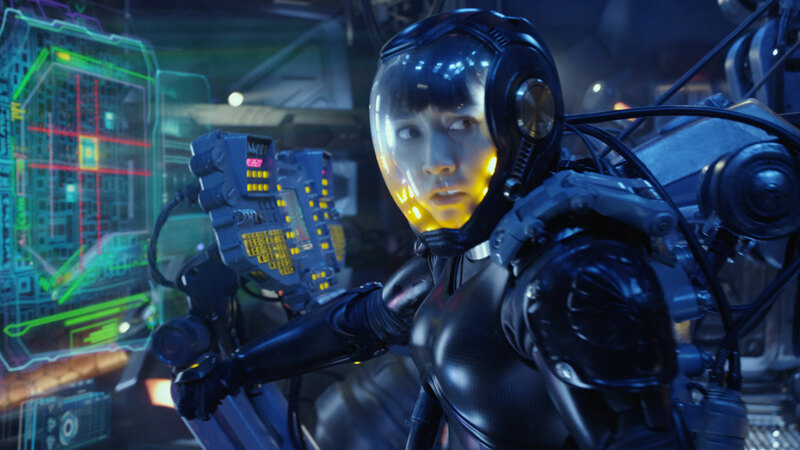 Pacific Rim opens with some big fights and some dazzling FX. The elemental FX such as water, dust and fire are always the hardest to achieve realism with, and the animators have done a fantastic job. The weight of the Jaegers in the water looks tangible and considering the amount of camera work that would have to be CGI, the battle scenes are very impressive. Buildings are not only demolished, they are smashed into oblivion. The film is half an hour too long and it sags in the middle, especially while the “character development” is forced upon us. Thankfully, the pace is well and truly picked up at the end, including the final battle with a typical dry retch cliché ending. 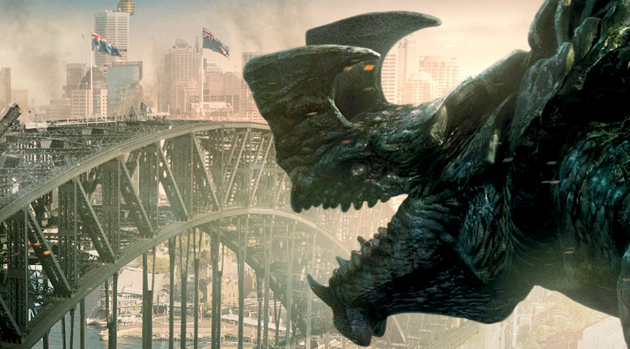 Be on the look out for Sydney harbor getting smashed to pieces by a Kaiju emerging from the deep. It will have people cheering in the cinema, which is strangely funny if you think about it. 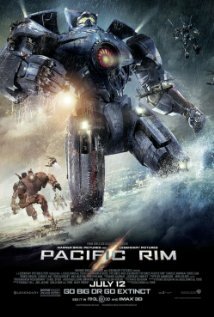 Pacific Rim is an enjoyable film, which could have been much better. Its fun lies in the special effects, design and destruction. It is severely lacking in all other departments of filmmaking. With an accomplished character and FX director at the helm, this film should have been elevated in quality beyond its roots or American influences. Whether this was studio pressure or the director’s decision, it is hard to know. The mass appeal of Pacific Rim will be to the people who watched Voltron, played Rampage, fans of Godzilla and anyone who likes watching stuff get smashed in a big, big way.